Having been driven out of Boston, the British did not intend to lose in New York. General Howe arrived from Halifax with 130 ships on June 25, 1776. His brother, Admiral Howe, showed up on July 12 with 150 more. With the greatest armada the world had ever seen off Sandy Hook, the Americans were ill-prepared to cope with the imperial might. A single battery of nine-pounders fired on the British as they passed the Narrows, killing a sailor and wounding nine more. It was the only time in history that defensive guns at the Narrows were fired in anger. The passage of the British fleet into New York harbor and the subsequent capture and seven-year occupation of the city left a deep impression on the young country. 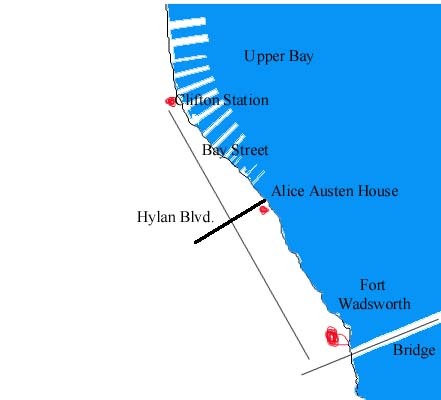 The defenses were improved to the point that in subsequent wars over a period of two centuries, no enemy ship even tried to approach the gateway to the harbor. 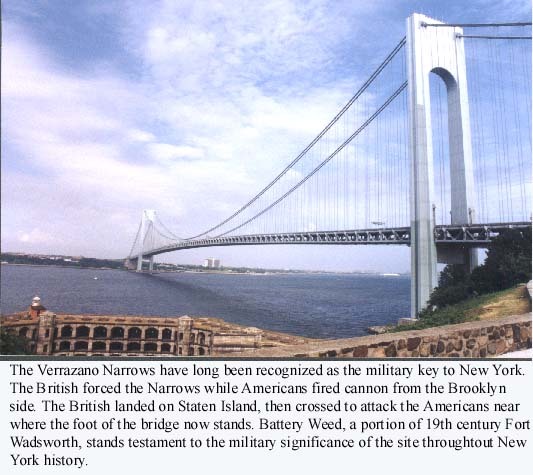 In 1776, the British first landed on the Staten Island side in the vicinity of what is now Fort Wadsworth. Once ashore, they planned their attack on New York. On Aug. 22, the British were ready to move across the Narrows. 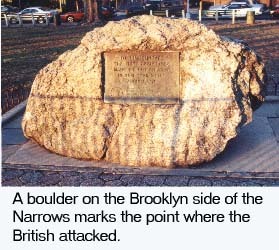 Six ships fired their guns as flatboats, longboats and bateaux carried 15,000 British soldiers to the Brooklyn shore near what is now the site of the Verrazano Narrows Bridge. The 200 Pennsylvania riflemen in the area were no match for the British army and quickly withdrew. 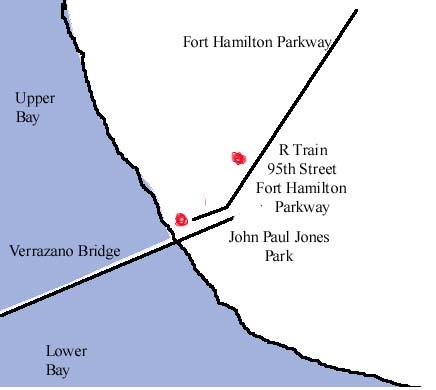 The area where the landing occurred is now John Paul Jones Park, named for the Revolutionary War hero of the American Navy. On the Staten Island side, Fort Wadsworth, a 19th century fort, watches The Narrows. Nearby, sits the Alice Austen House, a Dutch cottage taken over by the British during the war. It gets its name from the photographer of 19th century life who lived in the cottage from childhood. Address: Brooklyn Side: The Foot of Fort Hamilton Parkway, below the Verrazano Narrows Bridge; Staten Island Side: The end of Bay Street, Fort Wadsworth, near the Verrazano Narrows Bridge. Borough: Brooklyn and Staten Island. Hours: Fort Wadsworth: Wednesday through Sunday, 10 a.m. to 5 p.m. . Phone: Fort Wadsworth: 718 354-4500. Tours: Fort Wadsworth: 2:30 p.m. Wednesday - Sunday; also 10:30 a.m. Saturday and Sunday.